Olx Refer and Earn BookMyShow Gift Vouchers BookMyShow Offering Share and Earn Loot Offer why you wait share your friends and family and earn BookMyShow Vouchers. Bookmyshow tricks and hacking tips how to earn easly more vouchers and points. Download BookMyShow App and go to my wallet and activate and enter BookMyShow Referral Code and get Rs 50 in your bookmyshow wallet free and Also refer BookMyShow to your friends and earn upto Rs. 1250 credit for free. Login/Sign up to your account on Bookmyshow. Now click on You >> My wallet >> verify your mobile number. Share code with your friends. Your friends sign in to BookMyShow mobile app and activates using your bookmyshow referral code. Your friend make first transaction of Rs. 200 or above. You get Rs. 50 BookMyShow wallet credit. You can refer upto 25 friends = Rs. 1250 free credit. BookMyShow Referral codes are visible only for those who have Booked ticket on BookMyShow. If you are a new BookMyShow users then you need to buy one ticket Rs. 200 or above (excluding convenience fee & taxes) to generate your own referral code. You are eligible to earn referral credits under an ongoing BMS ReferMyFriend promo only when the friends who you’ve shared the codes with purchase a ticket/tickets on BookMyShow whose cumulative value greater than Rs. 200 (excluding convenience fee & taxes). 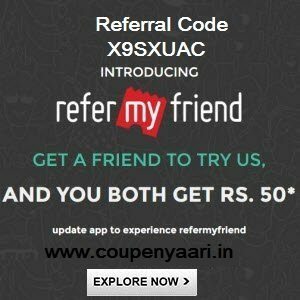 Standard amount of BMS referral credit under the ReferMyFriend promo is Rs 50 for both parties, receivers and senders. You can receive the indicated value in BMS credits under the ReferMyFriend promo only till the midnight of May 2nd, 2016 on all Indian cinemas booked through the BookMyShow app. For any further questions on BMS ReferMyFriend promos or issues with credits please write into [email protected] or call on 022-4208-5050. To raise an issue from within the BookMyShow app, tap-on the YOU tab and find the MySettings icon on the top-right of this page. On clicking on MySettings, you will be able to find the options of Insta-help, Call us or Email us. • Your Contacts : We need access to your contacts, so that you can invite your friends to join you after you’ve booked your tickets. Your information will kept confidential.